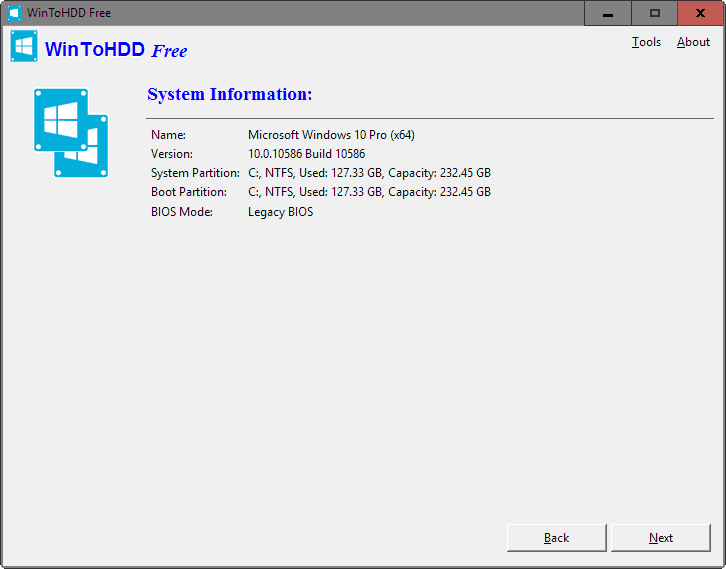 WinToHDD is a free program for non-commercial use that is dead easy to use. You do need access to an ISO image of Windows though for some of its functionality though so make sure you have one available. In case you don't, here is a guide on downloading Windows 7, 8.1 and 10 ISO images from Microsoft. You need a Windows ISO image that matches the installed operating system to make use of the feature. A click on the "reinstall Windows" button starts the process. You are asked to select an ISO image from the local system, or may switch to CD or DVD instead if the computer has a drive connected to it to load the image from disc instead. Once you have loaded the ISO image and select the right operating system -- an ISO may contain multiple versions of the OS, for instance 32-bit and 64-bit versions -- click on the next button to proceed. WinToHDD selects the right boot and system partition automatically in the next step but it is recommended to make sure that those are set correctly before you continue. The program creates a WinPE image next which takes a couple of minutes before it prompts you to restart the computer. Windows will be re-installed on the next boot. This works similarly to re-installing Windows but with the difference that you may select a different boot and system partition. Please note that you cannot select the partition that Windows is installed on currently for the new installation. The process itself is identical however after you have selected the desired target partition. WinToHDD creates a WinPE image and requests that you reboot the system so that the new installation of the selected Windows version can begin. You need to run WinToHDD as a system administrator for this option. Basically, what it does is clone the current installation of Windows by copying it to another partition or drive connected to the computer. The program creates a WinPE image after you select the destination partition and requires a reboot to start the cloning process. WinToHDD is an easy to use tool for the most part especially when it comes to the re-installation of Windows. The new installation and cloning features however require a second partition or drive which need to be created using other tools, for instance Windows Disk Management or third-party tools before they can be used. if i will clone my OS on the other drive, the destination drive will be re-formatted? Cloning will only copy the contents of one partition to another, it won’t affect the source. If you boot from different ISOs often, i would recommend using special hard disk box, like Iodd 2531. I allows you to mount any ISO on the fly. It is detected as USB CD-Rom device by the system. And it’s really convenient. These boxes were sold under Zalman ZM-VE300 brand. Sadly Zalman decided to finish this line and went with some other (probably cheaper Chinese) chipset in ZM-VE350, which has horrible reviews. This utility actually installs Windows sidestepping its installer. Does WinToHDD allow installing another Windows OS (New Installation) than the current one? I’m running Windows 7 : could I run WinToHDD to install Windows 10 with “New Installation”, hence on a new partition? With “New Installation” do I have to create myself the new partition first or does WinToHDD handle that as well? You need to create the partitions before you run the program but can install any recent version or edition of Windows you have an ISO for. Would it be recommended using this to clean install fresh new WIN OS onto a new SSD [which hasn’t been installed, yet!] ? If so- won’t windows create&configure the SSD partition on his own and assign it with what it needs automatically without using any third party program as mentioned above? That’s what it’s supposed to do if I was to disconnect the current OS running HDD [temporarily] and connect the SSD for the new OS installation process over the SSD, right? Are you then saying that I could create a partition and install Ubuntu, then install windows alongside it for dual boot? I checked the website and EasyUEFI looks like it may do it, but there are no instructions even though their youtube demo suggests both can be side-by-side. It might be nice to have win8.1 alongside Ubuntu on this one PC. By the way, I know Ubuntu is supposed to install alongside win8.1 as it is, but I was never able to get grub working for the dual boot without it trashing win8.1, so I went back to separate PCs for each OS. No, you need to run the program from Windows. I have not really played around with dual-booting or triple-booting systems in a long while, maybe I should start doing so again. Have you tried the other way round, first installing windows, then Ubuntu? In the Clone option, if using a New SSD/HDD for example what about Win10 license/activation status. Doesn’t that get affected since its now specially linked with your machine hardware. Switching hard drives should not be a problem regarding Windows 10 license/activation.